Josta Keil creates an elaborate representation of reality, one which slightly distorts and re-structures our world into a new conceptual entity. Evident by her predominantly figurative style, which makes use of accurate drawing and coloring, while utilizing bold distortion techniques that radically change the final result. 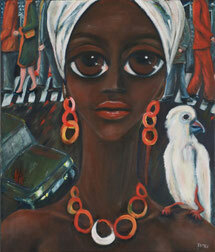 This is most evident in the eyes of the characters, painted more significant than usual with a blank, esoteric stare that adds emotional intensity to her works. In essence, it is a subtle reference to the inner contrast of emotions that exists in each. Thus, Josta Keil has an emerging duality in her work, contrasting the real world with the conceptual world that exists in every person, a state of being underlined by her aesthetic and artistic choices. Josta Keil narra il contatto tra uomo e animale. Esso avviene in modo spontaneo e rivela forza di espressione, di sentimenti reciproci e potenza di condivisione. Uno sguardo all'interiore è dunque l'arte di Josta Keil che è preziosa testimone di un indiscusso talento. 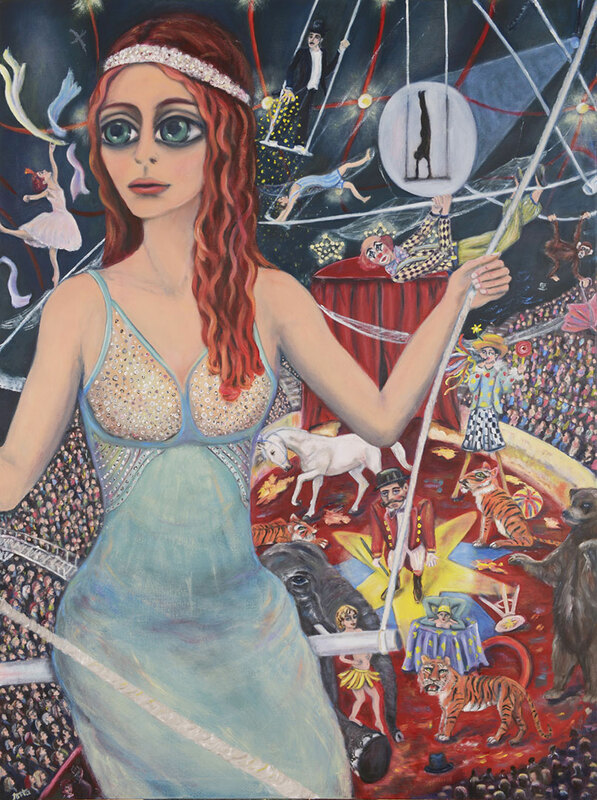 In this Josta Keil`s painting we can notice the subject rising and falling above a circus full of a colored crowd; she is a trapezist, and the attention is focused on her, and also a tiger from below, looks at her elegant figure. 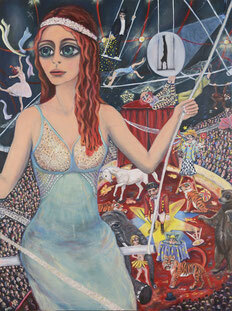 The allegoric and magic world of circus, is here represented with bright colors and several details, from the crowd in the distance, tot he tigers and the other artists that surround the scene. We can also notice a reference to Mark Chagall`s style, although the artist preserve her orginality and personal touch. „The girl and the shoes“ is a painting whose theme and subject are merely naif, even if the painter has a personal style that is rooted in different artisic trends. 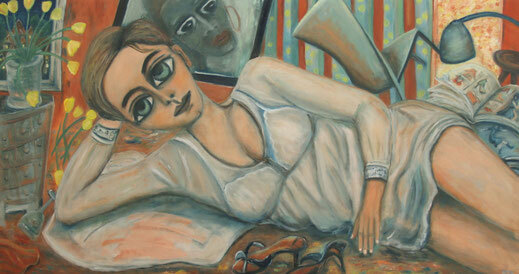 The color she chose are soft and cold, for exception of some warm details, and they give tot he painting a pale and calm atmosphere, that allows the observer to feel part of it, as if, while he`s looking at the artwork, could feel himself seated on the bed with this sweet and delicate girl.